Sometimes I want tacos. This post, unfortunately, is not a taco recipe. However, I first made this flan as a dessert a few months ago for a Latin food club night and recently for taco night and it was the highlight of both evenings. Since this absolutely needs at least an overnight session in the refrigerator, it's the perfect make ahead dessert the next time you need to feed a crowd, Latin night or not. Unlike other flan recipes that utilize condensed and evaporated milk, this flan is made of just eggs and milk. I find this not only makes this recipe not sickly sweet, but also makes the eggs come out silky smooth - the real star of the show. If you just visited your farmer's market and came home with a dozen farm fresh eggs (the ones with orange yolks and crazy shells), plop them into this flan ASAP. I tweaked the amounts slightly because I wanted a larger round shaped flan, not rectangular as in the original recipe. Baking time for this larger pan is roughly the same, better to over bake flan than under bake. If unsure of doneness, give it a few more minutes. My flan (as evidenced by my photos) tends to have a slightly light caramel. Caramel turns amber very quickly, so I error on the side of light (mostly because I've burned it before) feel free to cook it darker, to your comfort level. Make caramel: Pour 1-1/2 cup sugar and 3 tablespoons water into a saucepan, preferably one that is white or light-colored inside and with a pour spout. Place over medium heat and bring to a boil. Do not stir. 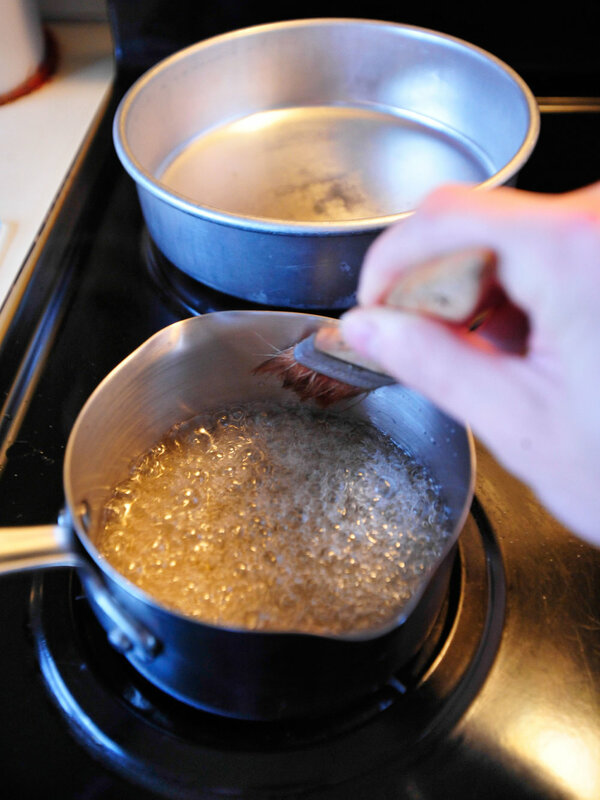 If sugar crystalizes and hardens around the edges, run a wet brush around the pot allowing the dripping water to remelt the sugar and incorporate. Let boil until deep amber in color, swirling the pan occasionally to caramelize evenly, about 10 minutes total. Watch the pan carefully after the mixture starts turning golden; it will quickly become light brown, then amber, then dark amber. Immediately pour caramel into a 10-inch round pan and swirl to coat the bottom evenly. Set aside to harden. In a saucepan, combine milk, lemon zest, salt and remaining 2-1/4 cups sugar. Over medium-low heat milk mixture, stirring to melt the sugar until warm. Do not let boil. Set aside to let lemon flavor infuse, 10 minutes. Using a whisk, combine eggs, egg yolks and vanilla. Blend until smooth. Remove the lemon zest strips from the hot milk mixture. Pour a little of the warm milk mixture into the eggs. Go very slowly at first so that the eggs don’t cook from the heat of the milk. Blend just until smooth. Pour egg-milk mixture through a metal sieve to remove any cooked into the caramel-lined pan. Boil a kettle of water. Place a 9x13-inch baking dish in the lower third of oven. Carefully place the flan into the baking dish. Pour boiling water into the baking dish until it comes about halfway up the sides of the round plan. Bake 50 to 65 minutes, until flan is set around the edges but still jiggly in the center. A toothpick poked halfway through in the center of the flan should come out clean. Remove flan from water bath and cool on a rack for 30 minutes. Refrigerate, uncovered, until cold and firm, at least 8 hours or up to 3 days. The caramel will soften as it sits. To unmold, run a thin sharp knife around the edges. Let sit on counter for a few minutes or alternatively, wrap a warm wet towel around the base of the pan for a few minutes. Center a flat-bottomed platter or serving dish with a rim on top of the pan and, holding both, carefully and quickly flip the pan and plate together. The flan will fall onto the plate with a squelch; lift off the pan and let the caramel run all over the top. Serve chilled, in slices.